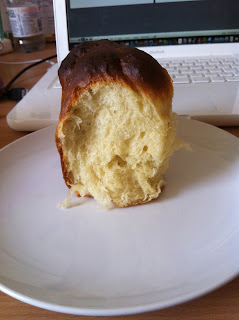 But moving onto my more exciting venture... Brioche! I have never made Brioche before and after The Great British Bake Off came to a close, I (like most of the country) decided that I could bake and thought that Brioche was the way forward. I used Paul Hollywood's book 'How to Bake' you can also find his recipe here. He said to use a machine that had a bread hook, but being a student, I don't have access to fancy technology, so I made the whole thing by hand in front of Strictly Come Dancing (my house mates thought I was mad!). The dough was really sticky at first and really elastically, but after a while it came together. I thought it was going horribly wrong, but I had read somewhere that it was supposed to glue your fingers together, so I ploughed on! After kneading the dough for at least 15 minutes I added the butter. This was really fun because the dough became soft and easy to manage (and it sounded like it was farting!). I would definitely advise starting this the night before, because once the butter is incorporated, it has to go into the fridge for at least 7 hours. I think if I had done it during the day I would have been impatient! So when it was morning all you have to do is knock back the dough (basically taking the air out) and then split it into 9 equal sized balls. Now, Paul says to use a round cake tin, but I don't have one at Uni, so I used a 20cm square tin. It doesn't look as good, but it does the job. Once you've put the dough into the tin, you then have to wait another three hours (I attempted work, but...) but then you can FINALLY put it in the oven. This was the scary bit, because my oven is truly awful, it is WAY to hot. So I turned it down a bit and just prayed! I sat in front of the oven true GBBO style and waited. It browned on top really quickly, but I knew this was meant to happen. It kept getting darker and darker though and the middle still wasn't cooking. After a while I panicked that it was too brown and put a foil hat over it. This seemed to do the trick and in hindsight I wished I done it early. Nevertheless, eventually my brioche was cooked and I could relax and finally (albeit reluctantly) get on with some work. I have just eaten my first chunk and it scrummy (tasted a bit like a croissant) and I can't wait for more, especially with some jam. If you attempt the brioche, let me know how it goes for you. Tomorrow I am going to make some profiteroles so I will see how they go. ps. who watched the GBBO final? Were you happy that John won? What about Brendan?! Using a wine bottle as a rolling pin... Oh yes!